It is usual to get huge 404 errors like that of post images in Google WebMasters Tools. Here is permanent fix for these WordPress 404 errors. Usually we face three or four types of 404 errors. These can get exacerbated when Google Bots re-crawls the whole site, usually an old site again for some reason – change in server (crawl increases on A Grade web hosts due to many factors), change in domain ownership data, implementing site-wide HTTPS, changing the domain name etceteras. WordPress is not very web software – it is a PHP driven, resource hungry web software. WordPress is famous for Frontend HTML output; but basically WordPress is not a web software which can be labelled as new generation web software. MySQL is one of the best database software, WordPress can make it appearing as a living problem. PHP is not very good programming language itself plus some core files create logical conflict in the database. Add the penalty for the badly coded Plugins. WordPress can make a very good website with lot content to appear as spammy to search engine bots, it can render the webmaster appearing a lazy person. Look at the Content-Type, it is rightly image/png. It will mean to Google Bot logic that this is not for indexing on Google Web Search, this will be referred to Google Image Search Bot. Whether you have a XML site map for images or not, invariably Google Image Search will list it. We use XML site map for images for faster indexing. 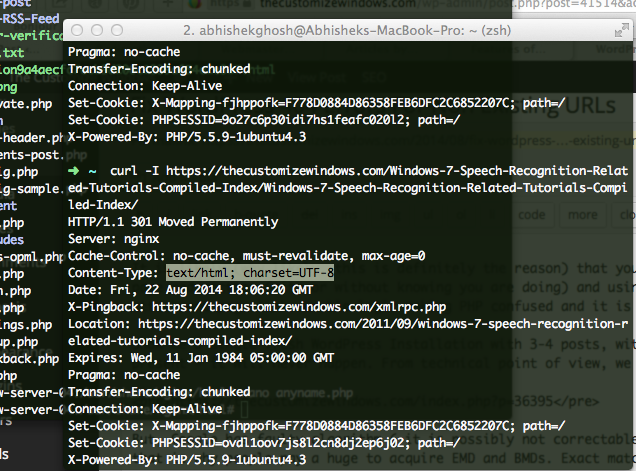 Yes, it is possible to get all the headers of all the contents of a web page with cURL. It will require a full tutorial how to do it – that is off topic but practically all search engine bots will run equivalent script for initial evaluation of a webpage. We Must Not Have Any /post-name/post-image-name/ Type of 404 Errors. I am telling you how to detect it and resolve it. It has nothing to do with Apache2’s .htaccess, WordPress Permalink or anything related to server. If you have fixed it by virtual host file manipulation, you are far away from detecting the issue. This is kind of prescribing pain killer for treating a patient suffering from cancer. Pain will get reduced – but the disease will not get proper treatment. So, we committed a kind of crime 301 at least once! If you used that ugly URLs, linking to the originating post would not create an infinite loop. Because that attachment’s (image) url would also be a different looking and ugly. For that post, WordPress has assigned a reference number – wp-image-36399. For managing that part, WordPress has Media Library. It is likely (why likely, this is definitely the reason) that you are using one or two plugins or ways for attachment page redirection (with or without knowing you are doing) and using a PHP based template for auto generating attachment page link. Double logic making PHP confused and it is printing a bizarre URL. But, Google has faulty algorithm ( it is possibly not correctable ) – Google gives priority to the KEYWORDS on URLs – that is why people pay a huge to acquire EMD and BMDs. Exact matched domain with exact matched Post URL with good content will always rank higher up. For Google’s fault we actually use the pretty permalinks. ?p=36395 is technically used by WordPress all processing on the backend. So we have explained the mechanism of action behind the problem. You have to make it like default WordPress settings – image should be image. You can only redirect the attachment page to the original post by setting the logic once only. If you have done some error by manual working – sadly, you need to edit all the pages – there is no SQL query which can solve the issue – there is query, but it can destroy / un-associate the GUID. After you are 100% sure that there is no such odd url are getting auto generated, go to Google Webmasters Tools and select all the errors and mark as Fixed. In Redirection Plugin, reset the log. Obviously you will get some GENUINE 404 errors – they can be only be detected from only Redirection Plugin not Google Webmasters Tools. You can 301 redirect such pages to proper post or category. It happens that we have wrongly linked any example like https://thecustomizewindows.com/anyname.php, it is better to create a real file with minimum information. If you ever did any manual on page optimization for the images by manually inserting urls to the images, we will suggest to check all the posts. It sounds horrible, but actually you’ll find that you have not done the crime more than 25% of all the posts. Edit 10-20 posts everyday. Also it will help to correct any typographical errors. There is no such plugin or SQL query exits which can fully reset to default – as you have manually overridden, you have to manually correct. Also Google Webmasters Tools will start reporting of such small number of posts as 404. As hopefully they will not cross more than 100, you can do it manually. Obviously it is better to avoid getting caught by Google Bots for the second time. One hint – Redirection Plugin catches the error before Google Webmasters Tools report! So, you have to keep an eye almost like an army! This Article Has Been Shared 5253 Times! Cite this article as: Abhishek Ghosh, "Fix WordPress 404 Errors For Non Existing URLs," in The Customize Windows, August 23, 2014, April 23, 2019, https://thecustomizewindows.com/2014/08/fix-wordpress-404-errors-non-existing-urls/.